Everybody has hurts. Life is full of them, and it would be naive of us to think once all is forgiven that the pain we have gone through doesn’t in some way affect the rest of our lives. We don’t always know why bad things happen to good people, but I do believe suffering is often a part of the process God takes us through making us who we are today. Of course not all suffering is sent by God, but God will use it to make us stronger if we let Him. In Genesis 32 we read about Jacob wrestling with God, but his pain led to blessing. His identity was transformed and his name changed from Jacob, meaning “deceiver” to Israel, and he was never the same again. Whatever suffering or pain you’ve been through, God has a plan and a purpose that will turn your life from sorrow into a blessing. “Gilead” was a mountainous area east of the Jordan River. It means “hill of testimony” and the balm that was produced there was a well known fragrant medicinal ointment with healing properties. Whatever life has thrown at you, can you testify of God’s goodness through your pain? Can you shine your light through someone else’s valley and say, “I’ve been there and I’m through the other side!”? Can you rejoice and say like Joseph, “You meant evil against me; but God meant it for good.”? It’s so easy to get into self pity and question, “Why God, why me? What did I do wrong? I’m a good person!” But sometimes we need to gain perspective and look at the bigger picture. Some of the most beautiful lamps in my opinion are moroccan lanterns. The designs are fashioned through carefully cutting, moulding and chiseling these beautiful designs into the metal. You may feel like you’ve been perforated, punched, cut and crafted, but your maker simply wants to shine through you. Shine through your brokenness to create something beautiful. Don’t despise what others have done to you, the pain, the suffering you’ve been through. Thank God He has brought you through. You may walk with a limp like Jacob did but you are blessed because of it. Now it’s time to stand on that “hill of testimony” and shine brightly for others to see what God has done in you. 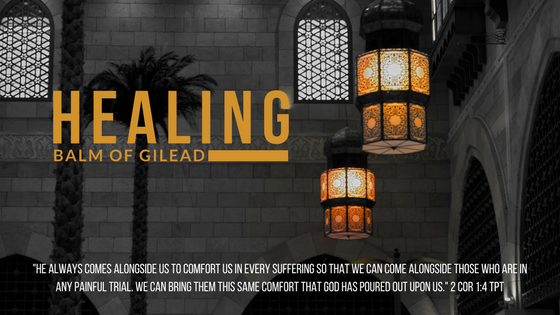 Become that healing balm to help others through their pain. It’s Jesus in you that healed you and it’s Jesus through you that will heal those around you. Thank you so much Vicky for this post. I love reading all your posts. They seem to come at just the right time and God uses them to remind me and teach me. Just as I was sitting down to have my time with God this morning I prayed about what I was going to do. This year the word the God has given me is “Shine”. I felt that I needed to delve a little more into this, but saw your blog notification and thought I would read this first. Wow! God is good. I just wanted to encourage you to keep writing because God is using what is pouring from your heart. You are being God’s precious instrument. Be encouraged and keep running God’s race marked out for you. Thank you Cathy. So glad this spoke to you.